It's no secret that he's a die-hard New England Patriots fan, the team from his hometown. 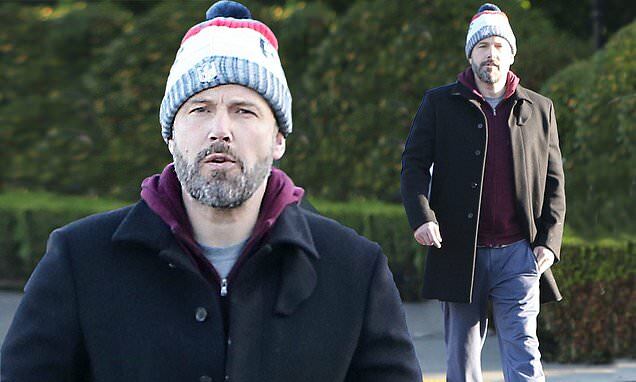 And ahead of Sunday's final grudge match against the Kansas City Chiefs, Ben Affleck was seen already showing his support for his team ahead of the game. The 46-year-old actor was spotted running errands on Friday morning, while wearing his team beanie loud and proud. Ben kept things warm and casual with a T-shirt and burgundy colored hoodie underneath his overcoat. He paired the look with loose fitting trousers and completed the ensemble with sneakers. The Batman star appeared to be in high spirits as he walked along the path around Los Angeles. Ben's supportive fan gear comes as the NFL team from his Massachusetts hometown prepare for their Sunday match against Kansas. The game will decide which team will make it to The 2019 Super Bowl on Sunday February 3. If the Patriots take home the win, they will join either the Los Angeles Rams or the New Orleans Saints in the Atlanta, Georgia hosted finale.